I've had these shoes for a few years now and they are seriously a favorite of mine! I also had a brown pair that I completely wore out. Don't you hate it when that happens??? Those bracelets again! I made a set for the shop and I set for myself and I find that I wear them almost every.single.day. I really love to stack all four that I have together for a chunkier look. Such fun! If you've been around for awhile, or follow me on instagram or know me in real life, then you already know that my just turned 11 year old daughter has soon mad skills. She can crochet like no one's business. This one isn't crocheted (I'm pretty sure that she made it on a loom) but I am completely in love with it, none the less. I love post earrings. Truly. I almost never have any in my shop, so its something I almost always ask for as gifts or look for on etsy. This delightful pair came from tru.che. More stacking bracelets from my shop. I seriously cannot get enough of them! The top one are the birthstones of my children - pearl and amethyst. The bottom is a fabulous multi-gemstone. Nice outfits! I love that yellow/green scarf. Great colors. 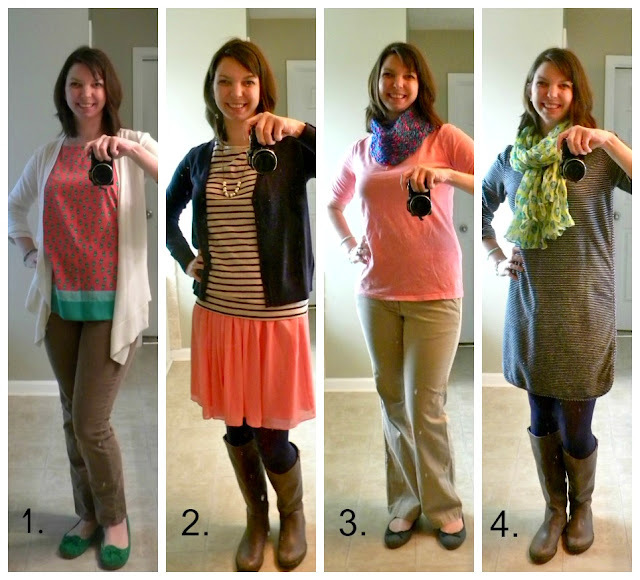 I did a post today on wear a striped dress (very similar to your dress) 7 different ways. It took me having the dress 4 months before I figured out how much I could do with it. Again, pretty outfits for the week. Those are some really cute green shoes! love all the looks. New follower, btw. Cute, cute, cute and CUTE! I love it all but #4 is my favorite. You look great! February is my month of doom.